Sadio Mane cleans mosque toilets just hours after scoring in Liverpool’s win over Leicester. 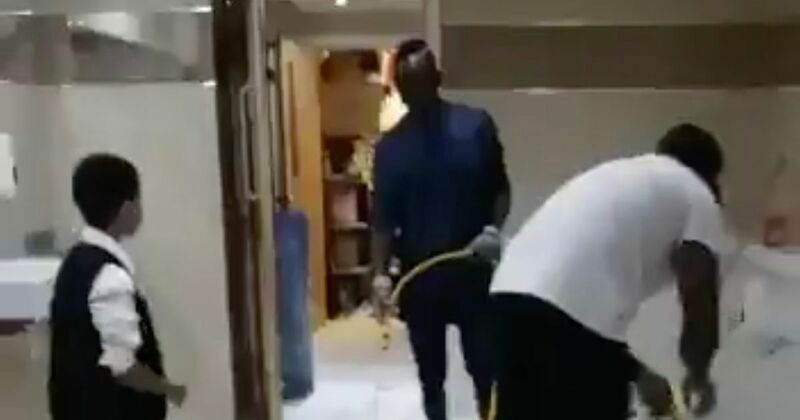 Liverpool star Sadio Mane has been pictured helping to clean the toilets at his mosque. The striker, who scored Liverpool’s first goal against Leicester on Saturday afternoon, appears to be filling up a bucket ready to clean the toilets in a video which emerged later the same day. It is understood the video was taken on Saturday night – just hours after Mane helped Liverpool maintain their 100% start to the season. The video was shot by Khalil Laher, who called the moment “humbling”. It quickly racked up more than 9,000 retweets and 18,000 likes on Twitter, with fans calling Mane “class”. The Senegal international is a committed Muslim, and celebrates his goals by practising sujood, which means to prostrate yourself before Allah. The 26-year-old striker is frequently seen to bend and kiss the pitch before pointing his arms to the sky. The former Southampton star was brought up in Senegal, where his father is the imam in their local mosque. He has previously spoken about what his faith means to him, saying he prays five times a day, and does not drink alcohol. Mane holds the record for the fastest Premier League hat-trick, scoring three goals in two minutes and 56 seconds against Aston Villa in 2015.